Have you ever taken an air shower? Every day the Subaru Team in the painting department of Subaru Assembly in Lafayette, IN do just that prior to entering the painting area. They enter the painting area by walking down a hall that has five Mars Air Doors suspended above them showering them with air to prevent contaminants from entering the painting area. The high expectations for only first quality paint finishes on the Subaru automobiles requires exceptional cleanliness in all the areas where the units are receiving coatings. In order to meet the levels of cleanliness required for their quality control, the workers suit up in clean uniforms including head covers, shoe covers and even beard covers to prevent dust and hair from becoming airborne and ruining the finish on their automobiles as they pass through the painting area. Not only are they required to don these uniforms they also must take an “air shower” to assure they have not picked up any foreign objects on their uniforms as they put them on. This air shower occurs automatically as the worker walks down a specially constructed hallway entry to go into the painting area. 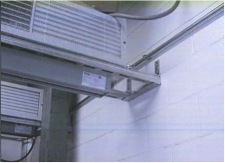 The air shower is activated upon opening the first entry door and remains on as a worker traverses the length of the approximately 20’ long hallway. 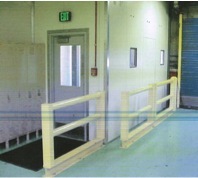 Using two 48” air doors, one at each entry and three 60” air doors in the center exposes each worker entering the area to five separate sweeps of air as the person passes through the hall. Working with the Gunn & Pegelow Applications team, Brad Mullen of J. R. Kelly Co. developed and installed this shower room in coordination with the quality control and engineering departments of Subaru. 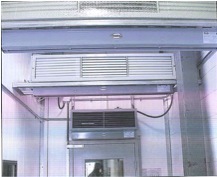 Mars Air Doors are increasingly being utilized in unique applications for clean areas, environmental isolation, heat loss control and insect control. If your concerns include entryway environment control call us and let us discuss how a Mars Air Door may provide the low cost solution for your project.